Pilot3D calls all lines, polylines, and curves as “curves”. However, the commands to create curves and polylines are different. These are polylines – lines that are connected as a single geometric entity or object. Both lines and polylines are created with the same command. To create a line or a polyline, select the Curve-Add Polyline command. 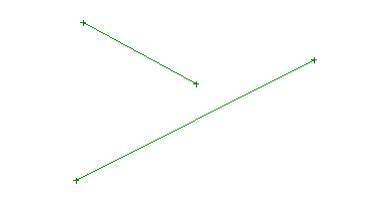 Define the line or polyline by positioning the cursor and clicking on the LEFT mouse button. Repeat this step as many times as you want. To stop entering points on the line or polyline, click the RIGHT mouse button. If you want to enter another line or polyline entity, you can do that right away. You do not have to select the Add Polyline command again. Use the Edit-Move Point command to grab and drag any of the ‘+’ edit points that define the polyline. You can also right-click on an edit point to set its [X,Y,Z] coordinate values. To DELETE a line or polyline, select the Curve-Delete Curve command. Then pick the line anywhere between any two edit points.